Points for the $2 million Sentient Jet Breeders’ Cup Juvenile (Grade I), the nation’s most lucrative race for 2-year-old Thoroughbreds, have been doubled for the 2015-16 Road to the Kentucky Derby – the series of 35 select races that determine which horses will qualify to the 142nd running of the $2 million guaranteed Kentucky Derby Presented by Yum! Brands (GI) on Saturday, May 7, 2016. Points awarded to this year’s Top 4 finishers in the Breeders’ Cup Juvenile will be 20-8-4-2, which is valued twice as much as its previous three runnings in the series. The race also is worth twice as much as the other 18 “Prep Season” races, which are considered by track officials to be foundation-building races over a minimum of one mile between September and late-February. Annually staged six months in advance of the Kentucky Derby, this year’s 1 1/16-mile Breeders’ Cup Juvenile will be staged for the first time at Keeneland Race Course on Saturday, Oct. 31. The increase in points to the Breeders’ Cup Juvenile is the only change from last year’s series of races. There was a modification to the tiebreaker rule for two or more horses with the same number of points. The first tiebreaker remains earnings in non-restricted stakes races but a secondary tiebreaker of lifetime earnings has been added in the case of remaining ties. If additional starters and/or also-eligible horses remain, they’ll be determined by lot (aka a “shake”). As was the case for the past two years, the Road to the Kentucky Derby “Prep Season” will commence at the home of the Kentucky Derby on Saturday, Sept. 12 with Churchill Downs’ $150,000 Iroquois Presented by U.S. Bank (GIII) at 1 1/16 miles. The 16 significant events that comprise the “Kentucky Derby Championship Series” during the 10-week run-up to the first Saturday in May remain unchanged from a year ago. This is the fourth consecutive year that Churchill Downs Racetrack will use a sliding scale of points awarded to the Top 4 finishers in choice races to determine preference for its 20-horse Derby field. At least 20 horses have entered the 1 ¼-mile classic for 3-year-old Thoroughbreds every year since 2004, and 15 of the last 17 years. A similar series remains in place to qualify for the Derby’s sister race, the $1 million Longines Kentucky Oaks (GI) for 3-year-old fillies on Friday, May 6, 2016. The lone change to the 31-race Road to the Kentucky Oaks series is the doubling of points to the $2 million Breeders’ Cup Juvenile Fillies (GI) to 20-8-4-2. * Race dates and distances to be announced by host track; date based on previous year’s placement. 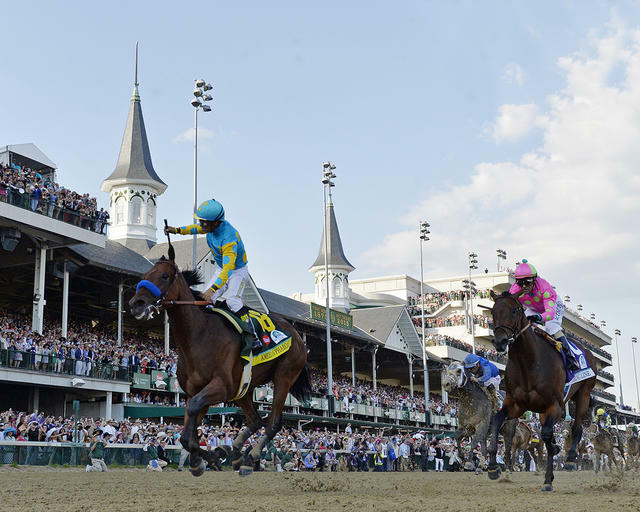 HOW TO GET INTO THE KENTUCKY DERBY STARTING GATE – The Road to the Kentucky Derby is a 35-race series that awards points to the Top 4 finishers in each race. The Top 20 point earners will earn a spot in the starting gate for the 142nd running of the $2 million Kentucky Derby Presented by Yum! Brands (Grade I) on Saturday, May 7, 2016. The Kentucky Derby field has been limited to 20 starters since 1975. At least 20 horses have entered the 1 ¼-mile race for 3-year-olds every year since 2004, and 15 of the last 17 years. TIEBREAKERS – If two or more horses have the same number of points, the tiebreaker is earnings in non-restricted stakes races. In the case of remaining ties, the additional starter(s) and/or also-eligible horses shall be determined by lifetime earnings. In the case of remaining ties, the additional starter(s) and/or also-eligible horses shall be determined by lot (aka a “shake”). FILLIES – If a filly wants to run in the Kentucky Derby she can, but she’ll have to earn her way into the field by accumulating points against open company just like the rest of the colts and geldings. Additionally, any points earned by a filly in the “Road to the Kentucky Derby” series against open company will be credited to her point total in the “Road to the Kentucky Oaks” series. DEAD-HEATS – In the event of a dead-heat (tie) in a “Road to the Kentucky Derby” race, those horses will divide equally the points they would have received jointly had one beaten the other. NOMINATIONS – Horses born in 2013 can be made eligible to run in the 2016 Kentucky Derby and Triple Crown with a $600 early payment due by Jan. 23, 2016. A late period for nominations at $6,000 each will be open Jan. 24, 2016 through March 28, 2016. In addition to the Triple Crown nomination fee, owners must pay $25,000 to enter the Derby by 10 a.m. ET on Wednesday, May 4, 2016, and an additional $25,000 to start. A horse not nominated to the Triple Crown with sufficient points may be supplemented for $200,000. POST POSITION DRAW – The Kentucky Derby post position draw – a traditional “pill pull” in which horses’ entry blanks are pulled simultaneously with a numbered pill to determine what stall a horse will break from the starting gate – will be held at Churchill Downs on Wednesday, May 4, 2016 at 5:30 p.m. ET (live on NBCSN). Up to 24 horses may enter the race and four horses can be listed as “also eligible” and would be ranked in order accordingly; they could draw into the field should any horse(s) be scratched before scratch time on Friday, May 6, 2016 at 9 a.m. ET. PRIZE MONEY – The Kentucky Derby winner will receive a gold trophy plus an estimated $1.24 million payday. A total of $400,000 will be awarded to the runner-up, $200,000 to third, $100,000 to fourth and $60,000 to fifth. BACKGROUND – Churchill Downs abandoned the graded stakes earnings criteria for the 2013 Kentucky Derby (used from 1986-2012) and proactively adopted a tiered point system to determine which horses would have preference for America’s greatest race. Today, a sliding scale of points is awarded to the Top 4 finishers in select races, and at the series’ end, the Top 20 point earners get first crack to start in the Kentucky Derby. ABOUT THE DERBY – To have a horse draped in the garland of roses while raising the solid gold trophy high atop the Kentucky Derby winner’s stand is the Holy Grail for horsemen around the world. Restricted to 3-year-old Thoroughbreds, horses only have one chance to win the Kentucky Derby, and it’s quite an accomplishment just to receive a berth in the starting gate. Approximately 23,000 Thoroughbreds were foaled in North America in 2013, and if history is any indication, about one percent of the crop will be nominated to next spring’s Triple Crown. Only 20 will be allowed to “Run for the Roses,” as the Derby field has been limited to 20 starters since 1975. At least 20 horses have entered the race since 2004, and 15 of the last 17 years. Once a horse earns its coveted Kentucky Derby berth, it, in most cases, will race the extended 1 ¼-mile distance for the first time. A combination of speed and the stamina it takes to complete the final eighth of a mile in the Derby often determines a win or loss. HOW TO GET INTO THE KENTUCKY OAKS STARTING GATE – The “Road to the Kentucky Oaks” is a 31-race series that awards points to the Top 4 finishers in each race. The Top 14 point earners nominated to the Longines Kentucky Oaks will earn a spot in the starting gate for the 142nd running of the Grade I, $1 million Longines Kentucky Oaks on Friday, May 6, 2016. The 1 1/8-mile Oaks is the nation’s premier race for 3-year-old fillies. DEAD-HEATS – In the event of a dead-heat (tie) in a “Road to the Kentucky Oaks” race, those horses will divide equally the points they would have received jointly had one beaten the other. ROAD TO THE KENTUCKY DERBY POINTS VS. MALES – If a filly wants to run in the Kentucky Derby she can, but she’ll have to earn her way into the field by accumulating points against open company just like the rest of the colts and geldings. Additionally, any points earned by a filly in the “Road to the Kentucky Derby” series against open company will be credited to her point total in the “Road to the Kentucky Oaks” series. SPLIT DIVISIONS – In the event a “Road to the Kentucky Oaks” race is split into divisions and each division awards its originally published purse money, points will be awarded as scheduled for each division. If the originally published purse is halved for each division, points will be halved as well. NOMINATIONS – Fillies born in 2013 can be made eligible to run in the 2016 Longines Kentucky Oaks with a $200 early payment due by late Feb. 27, 2016. A late period for nominations at $1,500 each will close Wednesday, April 13, 2016. A supplemental nomination of $30,000 may be made at the time of entry. In addition to the Oaks nomination fee, owners must pay $5,000 to enter the Oaks by 10 a.m. ET on Tuesday, May 3, 2016, and an additional $5,000 to start. POST POSITION DRAW – The Longines Kentucky Oaks post position draw – a traditional “pill pull” in which horses’ entry blanks are pulled simultaneously with a numbered pill to determine what stall a horse will break from the starting gate – will be held in The Parlay Media Briefing Room on Tuesday, May 3, 2016, at 11 a.m. ET. Up to 18 horses may enter the race and four horses can be listed as “also eligible” and would be ranked in order accordingly; they could draw into the field should any horse(s) be scratched before scratch time on Friday, May 6, 2015 at 9 a.m. ET. PRIZE MONEY – The Kentucky Oaks winner will receive a silver trophy plus an estimated $564,200 payday. A total of $182,000 will be awarded to the runner-up, $91,000 to third, $45,500 to fourth; $27,300 to fifth; and $10,000 each to sixth through last. Churchill Downs, the world’s most legendary racetrack, has conducted Thoroughbred racing and presented America’s greatest race, the Kentucky Derby, continuously since 1875. Located in Louisville, the flagship racetrack of Churchill Downs Incorporated (NASDAQ: CHDN) offers year-round simulcast wagering at the historic track. Churchill Downs will conduct the 142nd running of the Kentucky Derby Presented by Yum! Brands on May 7, 2016. The track will resume its 2015 racing schedule with its September 11-27 September Meet and a Fall Meet scheduled for Nov 1-29. The track has hosted the Breeders’ Cup World Championships eight times. Information is available at www.ChurchillDowns.com.